Members of Congress and President Obama are squaring off for a showdown. The US will hit the debt limit by the end of February, and with Obama insisting that he will not negotiate, “dooms day” scenarios are being predicted. Discussions of alternative solutions have yielded little in the way of progress. The idea to mint a trillion dollar coin has been dismissed, if it was ever a serious one to begin with. Prioritization, another option, involves the government selectively paying certain bills so that it does not default on its debt payments. Seemingly attractive, this option gets complicated because the government uses computerized systems to pay its bills. And since no decision by Congress will likely be reached until the 11th hour changing all of the payment software at the last minute would present a problem. However, even if they could manage to get things in order, this is only a short term solution with a lot of overhead. In addition, foreign investor hold U.S. debt and Americans will cry out if pay outs are made to foreigners before the American people. Former U.S. Rep. Ron Paul debated with Fed chairman Benjamin S. Bernanke in committee last year, about the possibility of selling the US Treasury’s 400 billion dollars’ worth of gold to cover the debt. However, with the government borrowing upwards of 100 billion dollars a month, this plan would cover approximately three months of borrowing while driving gold prices to record lows. One option remains: to delay appropriations payments to certain departments. Once again this is only a short term fix, because what they do not pay today must be paid tomorrow. These are some of the last remaining ideas to avoid the inevitability of raising the debt ceiling (of course defaulting on payments is still an option). Although Obama paints the Republicans as irresponsible, it seems that he just wants to get his way. Republicans insist a discussion and implementation of a plan that will cut government spending, and they are using their power over the budget to force the conversation. They are not backing down because they want to solve the problem now. Obama explained in a news conference that he was willing to have a conversation about ways to reduce the deficit, but the debt ceiling must be raised. Republicans understand the need to raise the debt ceiling (as seen above, there really is not any other option), but what they want is to set legislation in motion that will insure that the debt ceiling does not need to be adjusted in the future. The president has painted himself into a corner insisting that he will not negotiate, and doing so now will have negative consequences for him moving forward. It will be interesting to see what happens now – if the president negotiates, if congress backs down, or if the U.S. defaults on its debt. 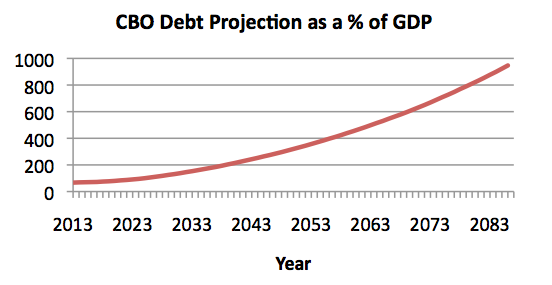 Tags: Debt, Debt Ceiling, economy, Fiscal policy, United States, United States Congress, United States public debt. Bookmark the permalink.